New technologically-advanced devices are constantly being developed for use in environmental laboratories. Generally speaking, their primary benefits lie in reduced analysis time, increased accuracy, and greater reliability. However, it’s not often that a device comes along capable of reducing analysis time by over 87%, DEENA is the exception. A fully automated sample digestion system for mercury and metals sample preparation, DEENA helps alleviate the bulk of manual sample preparation while greatly reducing the errors associated with sample handling. With less time devoted to sample preparation, laboratory personnel are free to perform other duties with the peace of mind that DEENA will provide consistent data in a clean, safe and timely fashion. In addition to dispensing reagents and heating the samples, DEENA – essentially an X-Y-Z robot - prepares calibration and spike standards, shakes the samples, inspects their color, adjusts the sample volumes after the digestion process, and records every step taken in the process. Steve Gunther, a product manager with Thomas Cain, was instrumental in the design of DEENA; in fact, he served in a design consulting role for the project. In a previous position, with a leader in sample handling and sample introduction equipment for elemental analysis, Gunther had become familiar with Hollis, N.H.-based Kerk Motion Products, Inc., one of the world’s largest exclusive manufacturers of non-ball lead screws. There was a substantial burden on technicians before the arrival of DEENA. Technicians were required to manually digest many samples per day for analysis. In addition, standing in front of hoods for up to four hours every day led to fatigue and back problems. Using DEENA, analyst time with the machine can be reduced from 4 hours to 30 minutes – the impressive 87 percent reduction mentioned earlier. What’s more, 60 samples and standards can be set for digestion during that time. 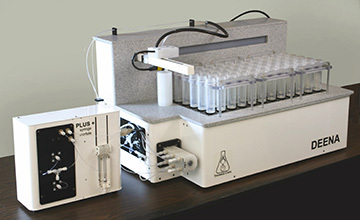 Using an automated sampling and dispensing system and a 95° C heating block, DEENA completes the digestion unattended. What’s more, the device is highly precise because of the standards dispensing syringe. DEENA (and the smaller DEENA mini) is the flagship product of Thomas Cain, an Omaha, Neb.-based company dedicated and committed to helping environmental laboratories improve their efficiency and simplify their processes by automating their manually repetitive and time-consuming tasks. As might be expected, accurate positioning is one of the most important considerations in DEENA’s operation. It’s particularly critical during one of the last steps in sample preparation, where the samples are filled with a precise volume of de-ionized water to replace any water that has evaporated during the preparation process. Consistent positioning is key for the other sensors to be able to achieve the precision required for this step, especially along the X-axis (long axis) and Z-axis. Back when the product was in its original design phase, there was thought given to using a traditional lead screw arrangement to ensure this precise movement. Yet doubt was raised as to whether a traditional assembly would be able to provide the required precision as well as address concerns regarding time-to-market and difficulty of assembly. One product that caught Gunther’s eye was Kerk Motion Products’ RGS® 10000 linear slide. The Kerk® RGS Rapid Guide Screw is a screw-driven linear slide that offers exceptional linear speed, accurate positioning, and long life in a compact assembly. When Gunther first saw it, a bulb switched on in his head. “Simple” only scratches the surface of the RGS benefits. The linear slide has a unique, compact profile that provides exceptional torsional stiffness and stability for its size and weight. Its integral mounting base allows support over the entire length if desired, and the length and speed of the RGS is not limited by critical screw speed, allowing high RPM and linear speeds even over long spans. The RGS series linear slide includes a precision aluminum guide and carriage, and is driven by a precision rolled stainless steel lead screw. The moving surfaces include Kerkite® high performance polymers running on Kerkote™ TFE coating. The RGS comes standard with a wear-compensating, anti-backlash driven carriage. DEENA’s X-axis incorporates a linear slide that is 28 inches long with a one-inch pitch (e.g., one inch per revolution). In the Z-axis, the RGS10000 is 8 ½ inches long with a half-inch pitch. The optional dispensing syringe also uses an 8 ½” RGS10000. The linear slide used in the X-axis positions a dispenser head over the vials at each step of the process; in the Z-axis, there are two slides linked by a chain, as this axis is actually an elevator that lowers the samples into the heater block. Consequently, the typical DEENA device contains three RGS10000s, and when the optional syringe is included, the machine uses a total of four. According to Gunther, a number of Kerk’s linear slides were designed into DEENA right from the beginning, displacing the alternative lead screw/rail/bearings arrangement. And while the parts cost is initially slightly more expensive for the Kerk components, the RGS helps save time and money over the long term because of the simplicity of implementation versus the precision required by the supporting parts of the traditional set-up. “All Kerk products are custom-built for each application,” explained Solon. “So although there are standard configurations, customers specify exactly what they want, whether it is special mounting features, sensors or brackets or something as different as special material or a custom rail profile. By using Kerk’s manufacturing skills and over 30 years experience in this field of motion control, we can provide exceptional value by consolidating components, simplifying assembly and delivering performance and reliability our customers expect.” Kerk credits their customers for pushing them continually forward. Working with industry leaders exposes them to new challenges and many of their customers participate in new product development at both the design and testing phases. There are currently 10 DEENA production machines out in the field at various locations. Response to the machines has thus far been extremely positive, given the myriad benefits that it offers within a laboratory setting. In particular, there are some lab technicians whose backs aren’t nearly as sore as they used to be, thanks to DEENA. Of course, the Kerk RGS must take at least a small portion of the credit for DEENA’s early acceptance. And while Gunther hasn’t completed analyzing the tangible benefits (e.g., time and money savings, reliability) of using the RGS in DEENA, he is already convinced the linear slides were a sound decision. It’s a move that Gunther would clearly make again. The Kerk RGS10000 – and the results it has produced in DEENA – has taken the pain out of sample preparation.